Disney's Villainous from Wonder Forge was one of the hottest games released in 2018 - and for good reason. It allows you to take on the role of Maleficent, Jafar, Ursula, Captain Hook, Queen of Hearts, or Prince John in an attempt to pull off evil schemes. In other words, it’s a board game where you’re the Disney villain and are rewarded for doing villainous things. If you haven't added Villainous to your board game collection yet, now would be a great time to do so. It's available via Walmart for $29.99 (25% off) with free pickup or free shipping on orders over $35, and via Amazon with free 2-day shipping if you're a Prime member. This is only $2 off an all-time low, so take advantage of it while you can. This is especially important because Wonder Forge / Ravensburger has confirmed that a Wicked to the Core expansion will debut at Toy Fair this weekend. Wicked to the Core includes three new Villains including Hades, Dr. Facilier and the Evil Queen. As noted, you can take control of one of six Disney villains in the game. Each villain has their own storyline that’s based on the events of their movies - Sleeping Beauty, Aladdin, The Little Mermaid, Peter Pan, Alice in Wonderland, and Robin Hood. Each villain also has their own board (their “realm” as it were), villain deck, fate deck, guide, and token. The fate deck includes heroes like Ariel, Aladdin, Peter Pan, Tinker Bell, Robin Hood, and Dormouse that can be used to thwart the villain’s plans. Each turn, the player moves to one of four locations in their realm, then takes actions that correspond with that space. There are different actions associated with each space and players can take those actions in any order that they see fit. Villains draw cards from their villain deck, which helps them move closer to their objective. Heroes picked from the fate deck can impede the villain’s progress and players are encouraged to use these fate cards to foil the plans of their fellow players while simultaneously working to achieve their own goals. As the game tagline notes, “the worst takes it all”. I own a copy of Disney Villainous and it's fantastic. Each villain has their own strengths and weaknesses, so every playthrough will help you to refine your strategies for playing individual characters and thwarting others. It's definitely one of those games that takes time to master. The official list of features for the game can be found below. WHAT YOU GET - Disney Villainous is a light strategy game for up to 6 players. In the box you’ll find 6 Boards, 84 Tokens, 1 Cauldron, 6 Reference Cards, 6 Villain Guides, and Instructions. CLEAR INSTRUCTIONS - Easy to learn with clear instructions! Additionally, each of the 6 Villains has their own guide. These guides will inspire you with strategies and tips for crafting the most successful plan to win! DEVELOPS STRATEGY SKILLS - Use your character’s unique abilities to reach your objectives. You can also play the Fate Deck against other Disney Villains to thwart them from attaining their objectives. CHARACTERS YOU LOVE - In this asymmetric style of game play, each Disney Villain has their own objectives and goals. Once you’ve figured out the best way to play as one Disney Villain, try to solve another! You have 6 different Disney Villains to choose from — Maleficent, Jafar, Ursula, Captain Hook, Queen of Hearts, and Prince John. The Fate Decks also feature your favorite protagonists like, Ariel, Aladdin, Peter Pan, Tinker Bell, Robin Hood, Dormouse, and more! 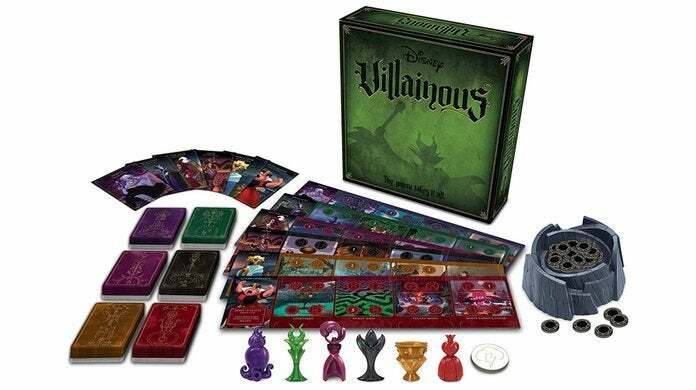 GREAT FOR DISNEY FANS & FAMILIES - Whether you’re playing with a group of devoted Disney fans, classic strategy gamers, or with your family, Disney Villainous is perfect for any game night occasion!